The sliding tile puzzle is a often a plastic trinket given out to children at various times, such as a school fair. 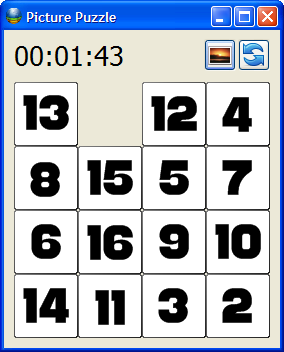 This version of the puzzle has 16 tiles, arranged in a 4 by 4 grid. The game play is simple: place all the pieces of the puzzle in their proper order by moving the tiles around. However, in the grid, there is only one empty space available to slide the tiles, which can make for a frustrating experience. And, in this electronic version, there is no way to pry off the plastic tiles to set them where you’d like. 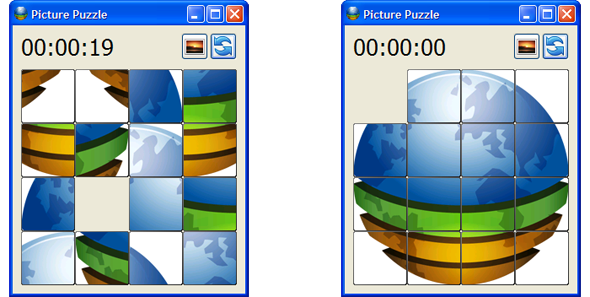 After installing the extension, select “Picture Puzzle” from the Tools menu to open up the game. A dialog will appear with 15 tiles arranged randomly that, when placed together correctly, will show the Kirix Strata logo. To move a piece, simply click it. It will move to the adjoining empty space. Move the tiles until you complete the puzzle. A timer is located on the top to show how long it took to complete. To change the image, select the picture icon on the top; a dialog will appear where you may select various images. To end the game and see the final picture, click on the refresh icon on the top; the correct image will appear. Click the refresh icon again to re-arrange the pieces in a random order so you can try again. * - This extensions integrates the ContentFlow library, which is used for selecting the different puzzle images.